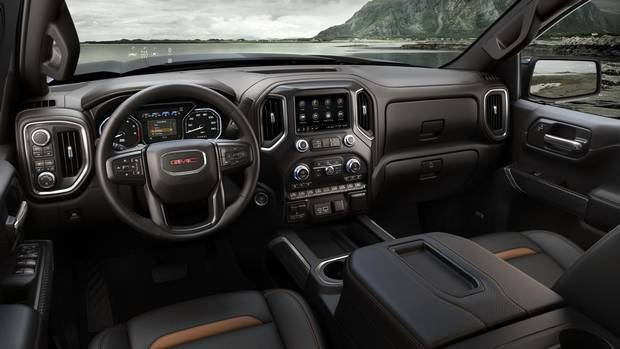 With four-wheel drive, skid plates and a luxurious interior, GMC's latest truck aims to lure a new segment of truck buyers. Much like country music and battered Levis, pickup trucks were once the domain of farmers, cowboys and other rural dwellers who work with their hands. Now, of course, country music festivals are full of teens from the suburbs, and battered vintage Levis sell for thousands of dollars to Japanese collectors on eBay. Pickups have likewise entered the modern era and become popular with all sorts of buyers, not just those who know how to birth a calf and rebuild a tractor engine. GMC, which has been making trucks for over 100 years, has been instrumental in pioneering a new class of pickups whose appeal extends far beyond the farm. The auto maker's latest foray in this realm, the 2019 Sierra AT4, unveiled this week ahead of the New York International Auto Show, reveals just how far the humble pickup truck has come. While GMC already offers trucks decked to the gills with luxurious accoutrements, their latest creation is something different: a cross between a luxury SUV and a jacked-up four-by-four. "The 2019 Sierra AT4 is designed for the customer who wants an elevated presence on the road and the capability to venture off life's beaten path," says Duncan Aldred, vice-president of Global GMC, presenting the car atop a rotating stage ringed with artificial rocks. "They want the ability to handle really tough terrain with confidence, but they don't want to compromise on premium features," adds Alan Batey, GM's president for North America. 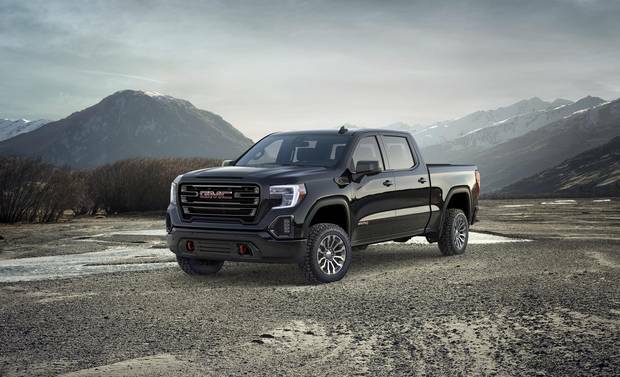 With its elevated stance, blacked-out trim and contrasting red vertical recovery hooks mounted on its front bumper, the 2019 GMC Sierra AT4 is designed to make a statement at the curb. The interior is similarly statement-making, with seats done up in Jet Black and Kalahari tan leather, and dark-tinted aluminum accents throughout. Tech-minded buyers, meanwhile, will be wooed by segment-firsts such as the AT4's multi-colour, configurable, head-up display and an integrated rearview mirror camera. The interior has dark-tinted aluminum accents throughout. For all of its interior cushiness, however, the Sierra AT4 comes with a serious list of off-road features designed to appeal to weekend warriors and wannabes alike. In addition to standard 4WD with low-range, the Sierra AT4 boasts a two-inch lift, off-road tuned Rancho monotube shock absorbers, skid plates, a locking rear differential and Hill Descent Control – a feature that assists the driver in safely descending steep grades. A 5.3-litre, V-8 engine is standard, while a 6.2-litre, V-8 or 3.0-litre, inline-six turbo-diesel, both paired with a 10-speed automatic transmission, are optional. The Sierra AT4 also boasts all of the improvements of the new 2019 Sierra SLT, which premiered in Detroit earlier this year. Among these is a carbon-fibre truck box, which GMC claims is the most durable in its class, and a new multipro tailgate, which can be easily configured in six different ways to ease loading, unloading and transporting different types of cargo. To aid in towing, the new Sierra comes with the trailering system and a suite of camera and app-assisted technology that uses the Sierra's infotainment screen to show you exactly what's going on behind the truck. It can also monitor tire pressure and keep a tally on individual fuel economy for up to five different trailers. Camera and app-assisted technologies show you exactly what’s going on behind the truck. Trucks and SUVs have long been reliable sellers for American auto makers such as GMC, but 2017 marked a new high-water mark for these vehicles, accounting for almost 70 per cent of all vehicle sales in Canada, according to a study by DesRosiers Automotive Consultants Inc. As consumers continue abandoning passenger cars and station wagons in favour of SUVs, pickups and crossovers, companies such as GMC are responding by creating ever-more enticing versions, such as the AT4, to meet the demands of these new buyers. "As we continue to push the premium truck space to new heights, we've learned that many of these customers want to take their adventures off-road and they'd like a premium vehicle to take them there," says Batey. 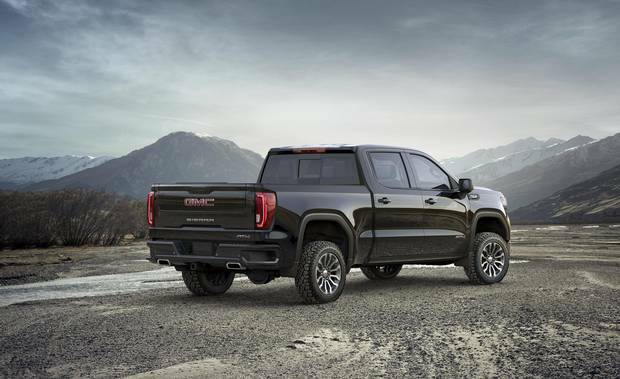 Just as the Denali brand denotes luxury within the GMC range, the AT4 nameplate will come to signify rugged, off-road performance when it first appears on showroom floors in the fall. It will roll out to the rest of the brand's lineup, GMC says, in the next two years. Trucks may have come a long way from the farm, but with GMC and its competitors hard at work on recruiting new customers from all corners, there's no telling how far they still might go.